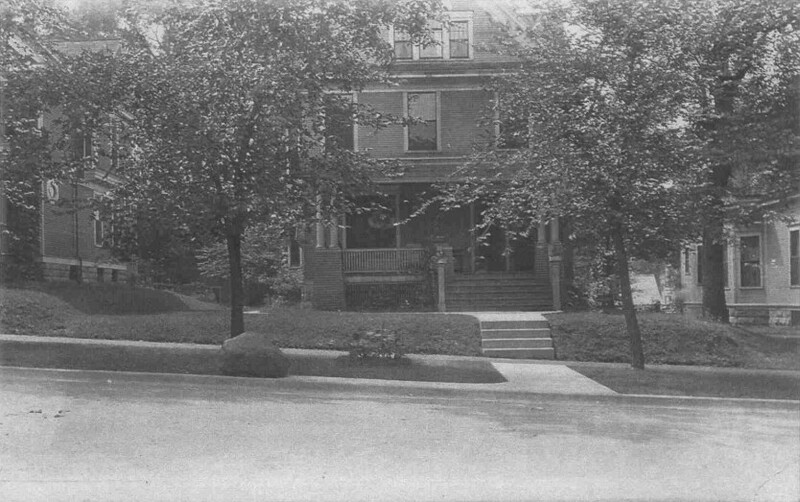 In 1902, Franklin K. Rhoads and his wife Frances retained local architect Leonard Drack to design a fine new home for their hillside lot at 1032 21st Street in Rock Island. Actual construction was done by contractor Diedrick Hoehenboeken at a cost reported to be $5600. A few years later, someone took a photo of the house and had it printed as a postcard. The photographer took several shots in this vicinity which were also printed on postcard backing. Although today’s card is in the personal collection of the owner, several others taken at the same time are in Augustana College Library’s Special Collections. One of these shows two little girls in front of the house. Perhaps one of these is Frances and the other is a friend. Frank Rhoads was born in 1867 in Pekin, Illinois, where he married Miss Frances Cook in 1893. They moved to Rock Island in 1900, following in the footsteps of his sister, Mary, who had recently wed prominent businessman James Frank Robinson. When Robinson died in 1902, Frank took over management of the Robinson family estate from an office in the Robinson building on the southwest corner of Second Avenue and 18th Street. 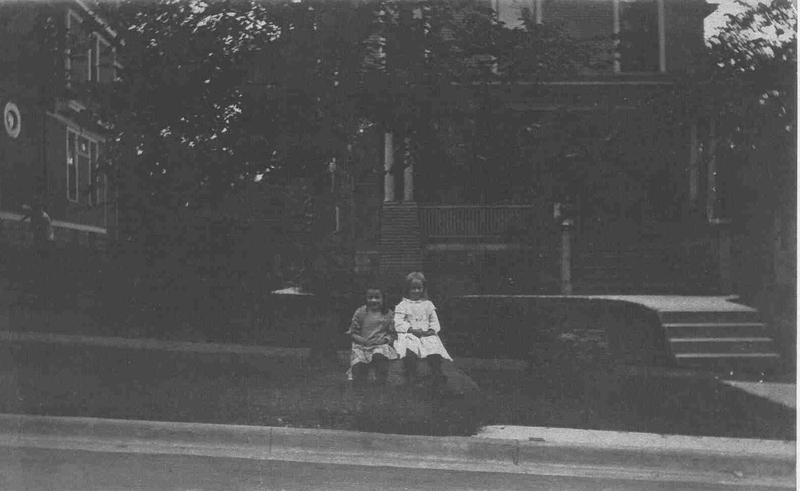 A man with many business interests, Mr. Rhoads also developed the Hedgeside Addition, a 105-lot subdivision between 18th and 20th Avenues and 40th to 43rd Streets. Frank and Frances had two daughters, Dorothy, born in 1895, and Frances L, who was four years younger. Although Mrs. Rhoads died in 1924, both of her daughters went on to national prominence. Dorothy graduated from Wellesley College in 1917 (one classmate was a young woman who would go on to become Madame Chiang Kai-shek) and lived at home with her father for most of her life. She and her sister ran a short-lived novelty and gift shop downtown, but she is noted for her authorship of children’s books, at least one of which is still in print. Her early books did not even bear her name as author, however a partial set is in the collection at the Rock Island County Historical Society. Typical of her titles and subjects was the book called “Nigalek, a Little Eskimo Boy.” Others in the eight paperback series included stories about Antelope, a Navajo; Gray Bird a Plains Indian, and Leaping Trout, an Iroquois. Dorothy’s sister, Frances, attended Northwestern University and married archaeologist Sylvanus Griswold Morley in 1927. Morley, who was over a decade older, was already known in his field for his research on America’s early southwestern people. He took Frances to Yucatan, where they lived for decades, excavating and restoring Chichen Itza as they studied the ancient Mayan culture. He even engaged in espionage for the US Navy. Some of Morley’s scholarly books are available in our area public libraries. Many argue that he was the prototype for movie director Steven Spielberg’s Indiana Jones. Frances contributed to his research and his books, creating a striking series of Mayan portraits for his book “The Ancient Maya” that was published in 1947. Her photographs were good enough for special showings in Chicago, New York, and Washington D.C. Mr. Morley died in 1948, a year after he wrote a 16-page Life magazine article. His wife lived until 1955. The Morleys also influenced the Rhoads family in Rock Island, as Dorothy and her father, who died in 1943, paid an annual visit to them in Yucatan. Dorothy derived great inspiration from those trips, and her later books focused on the ancient Mayans. Among them are “The Bright Feather and Other Maya Tales,” “Story of Chan Yuc,” and, her most famous, “The Corn Grows Ripe.” The latter was a runner up for the prestigious Newbery Award in 1957 and is still in print. The latter is available for checkout in many area libraries for checkout, but only the early edition is in the Rock Island library in the historic collection. By 1964, Dorothy had taken up permanent residence in Santa Fe, where her sister had maintained a home for years, and sold the Rock Island home where she had lived nearly all of her life. Dorothy died at age 90, when her obituary was noted in the February 24, 1986 Argus. Her family home remains, mostly unchanged except for the addition of aluminum siding. The siding is narrow and gray like the original clapboard. The trim is appropriately white, although much has been covered. A wide trim board once united the tops of the second story windows. The trim on the large “picture window” remains in place. Although large front windows are generally considered a 1950s architectural feature, many turn of the century homes had these big and expensive plate glass windows, usually topped — as this one is — with a fancy glass transom. The Rhoads house combines Victorian and Classical features. The overall bulk or massing is Queen Anne, with a steep and complex roofline, and an irregular footprint because of multiple bays. Foundations for houses such as this were complicated to build. The trim details are classical. The original porch with its simple columns in clusters of three dominates the front façade. The columns are set atop flared or “battered” clapboard-covered pedestals. The stair railings have recently been recreated, referencing the postcard for authenticity. The front gable contains a triple window with the central window topped by a Palladian-inspired semicircle. The combination of many classical elements as trim make this home a typical American “Free Classic” Queen Anne. Perhaps if it had been built a couple of decades later, the Rhoads sisters and their father would have asked their architect to incorporate a few Mayan details in the form of the house. That did not happen. Still, this old house, and some books help commemorate an exceptionally cultured family that was successful in business, literature, and science. This article by Diane Oestreich is slightly modified from the original, which appeared in the Rock Island Argus and Moline Dispatch on July 2, 2006.